Peacefully on February 11, 2019 at Yvette Willams Retirement Village; in his 88th year. Dearly loved husband of Aileen for over 66 years, much loved father and father-in-law of Allan and Diane, Kayleen Jepson, Stephen and Jill, Craig and Lyndel, and friend of Steven Jepson, dearly loved grandad Mac of Donna and Greg, Annette and Paul; Deborah and Juston, Amanda and Andrew, Blair and Emma, Nic and Jayne; Kelly and Mark, Sarah and Matt; Catherine and Jack, Pip, Robbie and Sarah, Nic and Aimee, and Chris, and great-grandad Mac to his 14 great-grandchildren. Special thanks to the staff at Summerset at Bischops court and Yvette Williams for their love and care. A service for Ron will be held in Hope and Sons Chapel, corner Andersons Bay Road and Oxford Street, at 3pm on Thursday February 14, followed by private cremation. 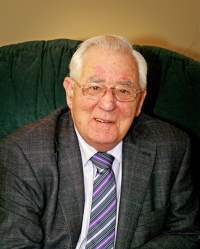 Messages to 3 Stratton Way, Mosgiel 9024, or leave a message on Ron’s tribute page above.